And this question builds on a previous article that I wrote about the types of coffee that you use in a percolator. 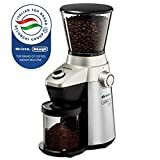 Astounding as it might sound, choosing the right coffee grinder is thought by many baristas to be the single most important factor in making great coffee. Related Post: What Kind of Coffee Do You Use in a Percolator? That is hard to get your head around when most caffeine addicts focus much more on the type and blends of coffee bean or on the method of brew than they do on the buying a great coffee grinder. Each one of them has their strengths and weaknesses. If you have one of these devices, your coffee is ground by hand by turning a handle round and round until your grind is the right size. There are three different types of manual grinder- wooden, glass and stainless steel. Beautifully Design: compared to other types of coffee grinder, hand coffee grinders are pieces of art. Quiet: there are no loud motors to make a noise. Portable: perfect for campers and adventurers that want fresh coffee wherever they are. But it is not all a bed of roses. Manual coffee grinders have their disadvantages as well. Effort: manual grinders require more effort as you provide the power! Time:manual grinders take longer to grind. Manual grinders are for people who not only love drinking great coffee, but love making it as well. They are for people who have the time to take that bit longer to create the perfect blend. These people love detail and have a vast knowledge of all things “coffee”. Electric blade grinders are the most commonly used grinders. The stainless steel blade looks like a small propeller. They are powered by electricity. I think that those advantages are simple and obvious enough to not need a more in depth explanation. Ugly: Most of these grinders are made from plastic. Need I say more? Consistent Grind: Electric blade grinders do not create coffee grounds that are a consistent size, because the “fineness” of the grounds depends only on how long your grind for. Coarse Grind: Electric blade grinders do not create quality coarse grounds, because of the limited length of “grind time”. Burns: The electric blades rotate so quickly that they generate heat and this can burn the grounds. Let’s face it, electric blade grinders are not ideal- particularly for use with percolators. I think that they are tools of necessity. users who don’t have lots of time. There are two types of burr grinders- flat and conical. They are made from either metal or ceramic. One of the burrs moves, whilst the other is stationary. The distance between the burrs determines the size of the grounds. The burrs spin round at high speed, trapping and crushing the beans in between them. This crushing action is different to the chopping or dicing action of the electric blade grinder. Crushing is a much better way of producing coffee grounds than chopping- you will have much more flavour and the quality of your cup of coffee will be higher. However, this quality and consistency comes at a (much) higher price- which comes as no surprise. But what are the other pros and cons of burr grinders? Consistent “ground” size: a burr grinder will produce a batch of grounds that are uniform in size. Size: They tend to be much larger than hand grinders or electric blade grinders. The cost of a burr grinder would put most percolated coffee drinkers off buying one. 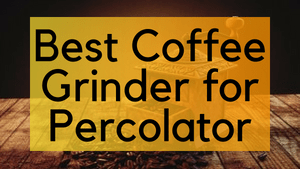 But if you love your percolated coffee and money is not an issue then this could be the grinder for you. Another potential buyer could be a coffee lover that needs to make large batches of ground coffee. Now, just because you have the perfect grinder for your percolator, doesn’t mean that you will automatically get great tasting coffee. And if you are struggling to reach the dizzy heights of “coffee perfection” when you use your percolator, you might want to look at changing a few things around a bit. De'Longhi-Ariete: De'Longhi the World-famous coffee machine brand, well known for the Artista Series espresso machines, De'Longhi is known for the design of its products, Certified by the Red Dot In 2007 and Quiet Mark 2012 for the innovation of their products - we always turning "the everyday" into something special. with years of experience, provides you the best on the market coffee grinder for your coffee refreshment. REMOVABLE BEAN HOPPER: Automatic locking bean hopper can be removed with beans inside without spilling useful to storage the beans dark and cool location for the freshness of the beans Grinding head assembly can be easily to clean thoroughly. This professional grade burr grinder is very easy to operate. ADJUSTABLE CUP SIZE: After you choose your coffee grind size use the User Manual guide (pg 4) to set the time dial according to the grind size and coffee cups you want, you will find a useful table sheet with clear information to help you choose the right timing, the unit is ETL certified so you can be confident that you're receiving safe, efficient, high quality appliances. It is important to note that, if you do follow this trouble shooting guide, that you only change one of these elements at a time. It is recommended that you use 1 tablespoon of coffee grinds to 1 cup of water. But don’t make the same mistake as I did when I first started to use a percolator. 1 cup of water in coffee terms means 4 oz of water and not 6 or 8 oz! The best grind size for percolator is a coarse grain- about the same size as the flakes in kosher salt or sea salt. If your grounds are too fine, then your coffee might be over extracted (or have too much flavour) and taste bitter and hollow. The reason for this is that the coffee grounds are so small that the water has absorbed too many of the compounds. If you grinds are too big then your coffee will be under extracted (with little or no flavour) and it will taste sour or salty. The reason for this is that the coffee grounds are so big that the water can’t absorb enough of the compounds that give off flavour. But it is important to note that the general size of the grounds is not the only issue “grind related” issue. There are two other main issues. Firstly, very often, batches of coffee grounds are not consistently one size- coarse grounds might also contains some medium size grounds or visa versa. Batches that contain different sizes of grounds will make “bad” coffee because some of the grounds will be under extracted and some over extracted. Secondly, if the beans have been ground using electric blade grinders then it might be that the grounds have been burnt in the process. Many electric blade grinders use very powerful motors (in order to get the job done quickly) but this short burst of power can also create so much heat that the grounds are burnt. The final common mistake that is often made when coffee is made in a percolator is that the percolation process goes on for too long. This is a hard part of the process to get right because it will differ from percolator to percolator and because it depends on the other factors discussed above such as the size of your coffee grounds and the coffee to water ratio. The best thing to do is to record the amount of time that you leave your coffee to percolate or “perk”. If your coffee tastes too bitter, then next time reduce the “perk” time and if is tastes to sour, increase the “perk” time. Recommendations for “perk” times vary between 5 and 7 minutes. Realistically the best coffee grinder for a percolator is a burr grinder because of the superior quality of grounds that they produce. But burr grinders are just so expensive that everyone but the most die hard percolator fans will faint at the thought of spending so much. Manual grinders offer the best balance between price and end product. They are reasonably priced but will produce a top quality coarse grind that is uniform in size. But, how many of us have seriously got that much time?! And can we be bothered with the effort? And so what we are left with is a race to the bottom! Electric blade grinders are cheap and they grind beans in seconds. But if you really must buy an electric blade grinder, do yourself a favour and get the very best!